You may be wondering, so we want to assure you, Santa Claus loves to visit this city too, so no need to worry. You can see for yourself why he does when you visit the Christmas markets and even the nearby snow skiing that is available in the Pyrenees. Barcelona’s Christmas markets are right up there with the likes of Germany and Sweden. Minus the snow of course that is, and with a lovely view of the sea nearby. And Santa likes that too. If you can only get to one market then be sure to check out is the Fira de Santa Llúcia. This is the main Christmas Market in Barcelona, located on the Plaza of the Cathedral in the city’s fabulous Gothic Quarter. Barcelona’s Cathedral is officially the “Cathedral de la Santa Creu i Santa Eulalia” also known as La Seu, and the market is situated on the Plaza de la Seu. What manner of gifts and treasures you will find here. 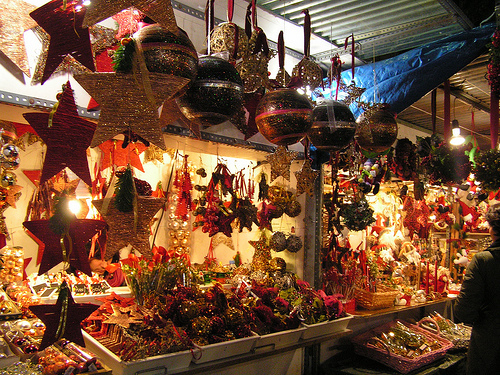 There are almost three hundred stalls selling handmade gifts, ornaments, nativity scenes – you name it. If you were not in the Holiday spirit before, you will find it here! You will also find a Catalonian charmer known as a “Caganer”. This little fellow is part of the local Christmas tradition since the 18th Century and he will be for sale in many of the stalls. He is the funny looking figurine with the red cap who comes out only at Christmas to ensure a good year ahead. How does he do that? Well, it’s complicated. Basically the “caganer” is depicted squatting, with his trousers around his ankles, taking a poop. He is traditionally placed near a nativity scene, hidden actually, though in recent times he has been banned from the public nativity displays. The “caganer” has competition from Caga Tio, a traditional wooden log with a painted face who likes a good whacking before he poops little presents on Christmas day. Let’s just say you will just have to spend a Christmas in Barcelona to get the feel for this silliness. Like any city, Barcelona has many lovely events to share at the holidays. 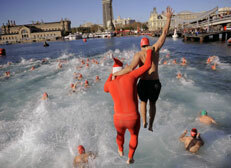 Some are traditional like the Three Kings Parade, and then some that make you shiver, such as the annual Harbour Swim on Christmas Day – we recommend sitting that one out!